Many things you can do with the Touch Bar that are actually much quicker to do the old-fashioned way. For example, you can open a new tab in Safari with the Touch Bar, but why would you bother when you can just press Command-T? So in compiling my list, I’ve only included tips where I think the Touch Bar is actually the best way of performing a task. Plus, in the essentials section, I’ve included some basic things you need to know in order to get started. If, like me, you used a Mac for years before the Touch Bar came along, you’ll already have established ways of performing routine tasks. That can make it all too easy to overlook the ways the Touch Bar can help. But if you make the effort to master these Touch Bar tips, I guarantee you’ll discover some genuinely useful time-savers to optimize your workflow. 1. Look down: If you type like a pro, you never normally look down at your MacBook Pro’s keyboard. That’s why it’s so easy to forget you have a Touch Bar busily working away down their trying to be helpful. But if you force yourself to look down from time to time, you’ll find the Touch Bar is frequently offering you helpful suggestions, directly relevant to what you’re currently doing. So get into the habit of looking at the Touch Bar when you’re stuck. It may surprise you. 2. Adjust settings with a single tap: One of the gripes I often hear about the Touch Bar is that it takes too many taps to do anything. But to access most slider controls, this is not the case. For example, you can adjust the volume with a single tap. Just put your finger on the volume button and slide it left or right. It magically transforms into the volume slider. Let go and it automatically turns back to a button. Simple. 3. Customize your Control Strip: There are two sides to the Touch Bar. On the left are the App Controls, which change depending on the app you’re currently in. On the right is the Control Strip, which is always visible. To edit the Control Strip, go to System Preference > Keyboard > Customize Touch Bar. The Control Strip has two modes: expanded and non-expanded. You can choose different controls to appear in each mode. Tap the chevron on the left of the Control Strip to toggle between them. Access the Control Strip from any app. 4. Customize your App Controls: Not all apps let you customize your Touch Bar App Controls. But many do, including Finder, Mail, Safari and even some third-party apps like Photoshop. To find out if the app you’re currently using supports custom App Controls, check the View menu and see if the Customize Touch Bar option is there. 5. Stop tapping the Siri button by mistake: If you find you keep hitting the Siri button accidentally every time you reach for the Delete key, you might want to hide the Control Strip altogether. Go to System Preferences > Keyboard and uncheck the Control Strip box. 6. Make room for more App Controls: Some apps, like Photoshop, provide so many handy controls that you might want more space to add them. Go to System Preferences > Keyboard and uncheck the Control Strip box. Then go back to Photoshop, go to View > Customize Touch Bar. It will now allow you to fill the full width of the Touch Bar with additional controls. 7. Switch tabs to access more tools: In some apps, like Photos and Preview, you’ll see a button on the far left with a chevron on it. This lets you toggle between different sets of controls, revealing buttons that are normally hidden. For example, in the Preview app, by default, only the rotate document buttons are visible. But tapping on the chevron button reveals options for selecting, highlighting and marking up images. Switching Touch Bar tabs in Preview. 8. Screen calls: When you receive a call, the caller ID shows up on the Touch Bar. You can answer or decline the call with a single tap. Use your Touch Bar to screen calls. 9. The function keys are not lost! If you use old-school apps that require the function keys, you can still access them. Just hold down the fn key, on the bottom left of the keyboard, and they magically reappear. 10. Get predictive text, just like in iOS: On an iPhone, when you start typing a word, the keyboard guesses where you’re going with it and gives you a handy button to autocomplete a word. The Touch Bar can work the same way. In any Apple apps where you compose text, just tap on the keyboard icon to the left of the Control Strip. Once you activate it, it will stay there until you tap the right-chevron button to hide it again. Get predictive text suggestions, just like with the iOS keyboard. 11. Emoji at the tip of your fingers: I think this is the single most useful feature of the Touch Bar. Selecting emoji was always a pain on Mac, because it didn’t have an emoji keyboard like iOS. But the Touch Bar changes all that. Just tap the emoji icon, then scroll to the right. 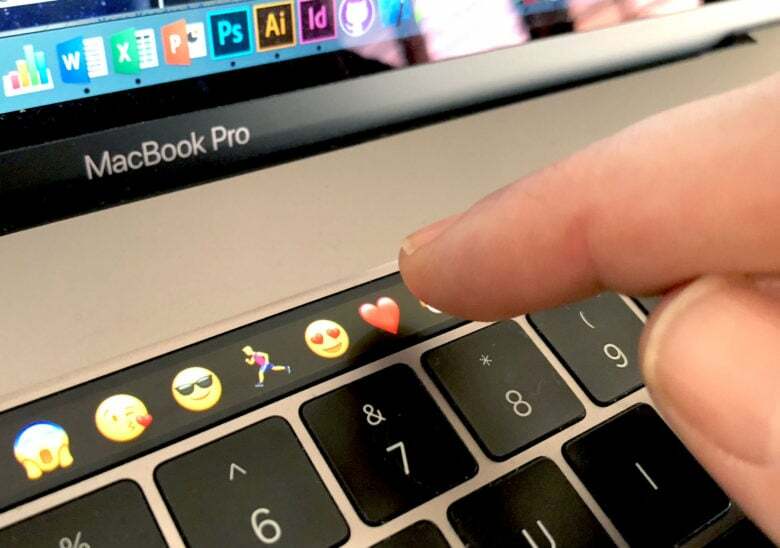 Emoji is the Touch Bar’s handiest feature. 12. Find the right emoji fast: In the emoji picker, your frequently used emoji are displayed first, so they’re always at hand. But if you like to use more-exotic emoji, you can tap on the clock icon to immediately skip to a particular category without having to endlessly scroll. Find the right emoji fast. 13. Convert words into emoji: Like in iOS, the Touch Bar recognizes words you type and suggests emoji you could substitute. Tap on the keyboard icon to expand the predictive text tool (unless it is already open) and you will see the emoji suggestions on the right. The Touch Bar always knows just the right emoji. 14. Access hidden formatting tools: When you are typing text, the predictive text suggestions often conceal some formatting tools. Clicking the right-chevron on the left of the predictive text will temporarily close it so you can access them. Alternatively, the predictive text is hidden automatically when you highlight the text you want to edit. 15. Change Finder views with a single tap: Tap and hold on the View Options button, and you can effortlessly slide between the different views without having to lift a finger. Switch between Finder views without lifting a finger. 16. Create a folder and move selected items into it with a single tap: Go to View > Customize Touch Bar and drag the New Folder With Selection button down into your Touch Bar. Now when you have files selected, you can just tap on that button to put them all into a folder, and bring up a cursor ready to rename it. 17. Share with AirDrop in just two taps: Using drag and drop to share files with AirDrop in the Finder is a hassle. With the Touch Bar, you can trigger a handy dialog box with just two quick taps. Tap on the Share icon, then the AirDrop button, and a list of potential recipients appears. Just use it responsibly and don’t be like Buster’s friend. 18. Your favorite website at your fingertips: I use some web apps, like QuickBooks and Twitter, all the time. So it’s awesome to have them just one tap away on the Touch Bar. If you want to add a website to the Touch Bar, just right-click on the icon in the URL bar in Safari and select Favorites. Make sure you have us on speed dial. 19. Reorder your favorites to make the sites you visit regularly easy to reach: You can’t reorder your favorite sites on the Touch Bar itself (although this would be cool, and I’m hoping Apple will enable this in a future update). But if you drag the icons around in the favorites view in the browser, this will also reorder them on the Touch Bar. 20. Log in to websites with a single tap: When you have the password to a website in your Keychain, Safari presents a login button right in the middle of your Touch Bar. Tap on that once, hit return, and you’re done. No need to tap on user name and password fields, or select Keychain options from a fiddly dropdown menu. One-tap login with Touch Bar. 21. Quickly toggle Reader view: There are several extra controls you can add to the Touch Bar in Safari. My favorite is Reader view, which magically makes all the crap disappear on cluttered website designs. Just go to View > Customize Touch Bar and drag Reader view into your Touch Bar. 22. In Mail, tap and hold the flag button to change color: By default, you only get a Red flag button in Mail. But don’t let that cramp your style. Tap and hold on the flag button and a bunch of other color options appear. Without lifting your finger, swipe to the left to switch colors. Give mail the yellow flag. 23. In Photos, scroll super-fast through your pics: You could always go forward and backward between photos using the cursor keys. But thanks to the Touch Bar, scrolling is now much faster. Don’t bother looking at the Touch Bar as you do this. The thumbnails it displays are pretty, but not very useful. Just keeps your eyes on the main screen and swipe left and right. You can go really slow, or really fast — you can even “throw” the scroller, to advance it rapidly, without the need to do multiple swipes. A quicker way to scroll through photos. 24. In Photos, making adjustments is easier: In edit mode, Light, Color and Black & White appear as three separate buttons. Tap on one to expand it, then simply swipe to adjust. You can keep switching between them until you achieve the desired effect. A handy blue checkmark indicates which effects you have applied. Checkmarks indicate which effects you have applied in Photos. 25. In Photos, compare before and after effortlessly: When you’re applying fancy effects to your photos, you want to be sure you’re not screwing them up in the process. That’s where the before/after button comes in. Just tap and hold on the View Original button to see what the image looked like before you messed with it. Toggle between the adjusted and original photo. 26. In Books, flick through the pages like you would a real book: Swipe the Touch Bar scrubber from left to right to flick forward and backward, but keep your eyes on the screen as you’re doing it to see the chapters and pages indicated. This really is the quickest way to navigate a long book. The scrubber shows black marks to indicate where each chapter starts. A white bar marks your current position. This provides an immediate visual indicator of how much you have left to read in the current chapter and the whole book. Effortlessly flick through the pages of a book. 27. Access iTunes controls from any app: When you’re playing music with iTunes (or listening to The CultCast), you can access a full set of iTunes controls right on the Touch Bar without even having to leave the app you’re currently in. Just tap on the weird icon in the Control Strip that looks like a bar chart. Access iTunes controls from anywhere. 28. Calculator buttons at your fingertips: Unless you’re a programmer, it’s hard to get used to using the asterisk symbol for multiplication. And clicking on the Calculator app’s on-screen keyboard is fiddly. So it’s a nice touch that the Touch Bar gives us back the old-fashioned pocket calculator buttons we all know and love. Calculator buttons multiply the Touch Bar’s usefulness. 29. In the Terminal app, add 20 function keys: If you think the classic 12 function keys look outmoded these days, did you know there are still some dinosaurs who lust for 20 function keys, from the VT220 Compact console? Luckily for them, all 20 keys are just a tap away when you customize the App Controls in the Terminal app. When 12 function keys are just not enough. 30. In Adobe Photoshop, customize your Favorites: There are some go-to tools I use all the time in Photoshop, such as adjusting layer transparency and changing brush sizes. It’s super-handy that Adobe lets me create my own set of essential tools in the Touch Bar’s favorites tab. Keep all your favorite Photoshop tools on the Touch Bar. 31. In Adobe Photoshop, scrub through your history: Gone are the bad old days when Photoshop would only allow you one undo. Today you can keep pressing command-Z to your heart’s content. And the Touch Bar goes one step further, letting you scrub through a visual timeline of your edits. See your Photoshop history in a visual timeline. 32. In Adobe Illustrator, combine multiple items in loads of cool ways: One of the most useful (and least known) tools in Adobe Illustrator, Pathfinder lets you select multiple vector objects and combine them in different ways to create new shapes. It can be tricky to find Pathfinder in Illustrator’s numerous menus, but on the Touch Bar it appears automatically when you select multiple vector objects. The quickest way to access Pathfinder in Illustrator. 33. In Microsoft Word, get big, clear previews of Paragraph Styles: If you’re a Word wizard, you’ll already know how to configure the styles for your document. But it can be a little fiddly to switch between styles — and easy to forget what they look like. The Touch Bar in Word provides a handy summary of all the styles in your document, allowing you to swipe through and select with a single tap. How to use Word in style. 34. Open recent files in Microsoft Office: Finding Word documents you’ve been working on can be a bit of a hassle, but the Touch Bar puts them all at your fingertips. Just tap on the Open Recent button (a document icon with a clock in front of it), and you can swipe through the list. 35. Take a screengrab of the Touch Bar: Command-Shift-6. ‘Nuff said. 36. The hassle-free way to take a screengrab: When you press Command-Shift-4 to take a screengrab of the main screen, the Touch Bar helps out, giving you the option to grab a window, a selection or the whole screen. It also lets you choose where to save the screengrab, including to the clipboard. The Touch Bar helps out when you take screengrabs. 37. Look out for the shadow to reveal hidden controls: Apps like Microsoft Word offer so many controls that they just don’t all fit on the Touch Bar at once. When this happens, the Touch Bar provides a visual clue — the button at the far edge disappears into the shadows. This means you can swipe left to reveal more controls. 38. Customize how your websites appear on the Touch Bar: By default, Safari shows favorites using a small favicon on a dull gray button. But you can make your websites look way more cool with a brand-colored button. To do this, you need to create a vector SVG file of your logo, and add a mask icon meta-tag to the headers in your HTML, linking to the SVG and specifying the background color. Here’s how to do it. 39. Add Quick Actions to your Touch Bar: In Automator, you can create Quick Actions that you can then trigger from the Touch Bar. It’s handy for tasks you perform all the time, like moving emails to a certain folder or extracting images from a document. Go to System Preferences > Keyboard > Customize Touch Bar to add the Quick Actions button to your Touch Bar. 40. Play Pac-Man and Lemmings on your Touch Bar: And finally, for a bit of fun, why not have a game of Pac-Man or Lemmings on your Touch Bar. Yes, really.